“Floating Into The Night” is the 1989 debut album by vocalist Julee Cruise featuring songs written and produced by composer Angelo Badalamenti and film director David Lynch. The songs "Falling" and "Rockin' Back Inside My Heart" were both featured in Lynch's cult television series Twin Peaks, while "Into the Night", "The Nightingale" and "The World Spins" also appeared in the show. 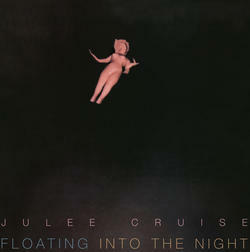 The instrumental version of “Falling” was the theme song for Twin Peaks while the album as a whole is almost an unofficial soundtrack to the series. The track “Mysteries Of Love” was prominently featured in Lynch’s classic film Blue Velvet. Cruise’s dreamy, light vocals match perfectly with the music and lyrics to make this album sound like it is unattached to any era. Reissued on red vinyl with a double sided insert by Plain Recordings. These are items which have flaws in their packaging. Discounted 20%. Factory sealed but with minor jacket damage (bent corners or creases) - would grade VG+, while the usual grade is M or M-. If you have any questions, please contact us. Our stock on this item is limited to the quantity we have on hand (Stock=3). The quantity we can supply is a maximum of this amount (3). Orders will be filled in order received until stock runs out.